Bring in data from SQL server, Salesforce.com, Google Analytics, Excel, Jira, and many more. Absolutely no code needed. Drag and drop visual elements to build fabulous looking dashboards. 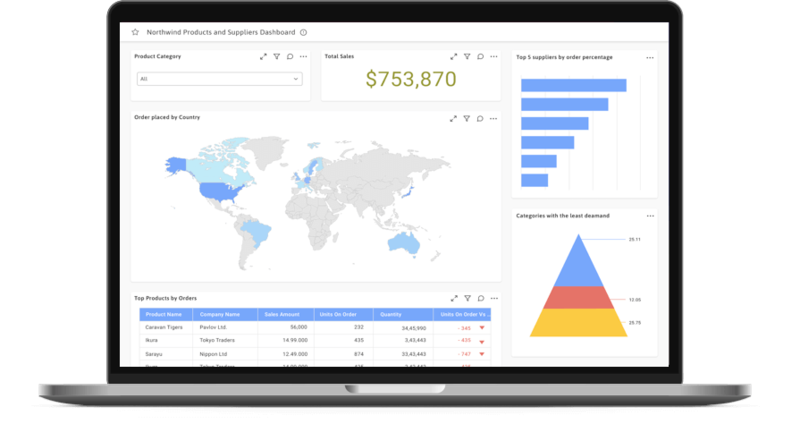 Our dashboards look pixel perfect, and make it simple to communicate KPIs and other related information. Sharing is secure. Share dashboards with managers, co-workers, and anyone else, anywhere and on any device. Absolutely no extra work or external systems required. Now that your dashboards are live, set your data refresh to auto-pilot mode. Simply set refresh settings and let the system do the work. Simply describe your dashboard through our concierge support system and we will build it for you. Completely free of cost with any subscription level. Concierge support does not end with on-boarding. Unfiltered. Informative. Based on user experience. Learn more about Syncfusion products and services from developers who use them.